At 6 years old, Quentin starts the competition but the motocross is not enough developped in his country, so all the family leave the island to realize Quentin’s dream. Since december 2014, the family settled down in metropolis. Noticed during a race in 2014, he became an official KTM-JBS pilot. He is training today at the MotoClub du Lac coached by Steve Bernard. Well aware of concessions and sacrifices have been made, Quentin thanks his family, all his partners ans sponsors which support him. Despite his young age his record is already impressive ! In 2015, he is crowned champion from Picardie as well as champion of France on the North zone in 65cc. The same year, he finished 3rd from the final of the French Cup in 65cc and 5th from the European championship in 65cc. 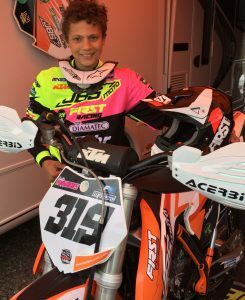 In 2016, Quentin moved up to the 85cc category. He became champion of France in minivert in 85cc (a section which prepares 8-12 years old to seniors races) and champion of the Midi Pyrénées league. Only 11 years old, the youngest of his category, Quentin is selected in Hope French team to participate at the European championships, coached by Pascal Finot. DIAMATEC faithful to its commitments in this sport wishes to Quentin all the success he deserves ! We are happy to help this young promising talent which going to carry our colors and values for 2017.